How we have helped others. Below are few of the numerous success stories from successful satisfied clients, past and present. A key component of the success of a small business is its branding and image package. The small business owner is faced with a daunting dilemma. How you project the uniqueness of your company within the constraints of a limited budget. My solution was to hire Dave Pedersen of Pedersen Design, LLC. I had interviewed several of the local graphic art and design shops. Their offerings appeared to me to be flat and mostly looked the same. Dave is a great listener. He combines this great gift with a refined aesthetic. After some probing conversation, he can usually produce a quite startling and spot-on representation of your business vision. It’s truly a great moment when he brings your ideas to life. Dave has won my continuing confidence to produce refined, timely and unique images to present my business in the best light. I am pleased to recommend Dave Pedersen for graphic art and design work. I have been working with Pedersen Design for 6+ years. Dave and his team have created numerous marketing materials ranging from business cards, letterhead, brochures, and various print and digital ads. As a business owner, during all phases of work, you feel you are working with experienced professionals who are truly vested in helping improve your business. Pedersen Design has been both a reliable and creative partner in nearly all aspects of our marketing and communications needs. They have successfully implemented our vision in nearly every medium we use in communicating to our industrial customers. Most of all, they truly understand our business and it shows in the work we proudly display on a global basis. I have been working with Dave Pedersen for over ten years and have found his work to always be completed on time, within budget, and in a creative and meaningful way. Pedersen Design is easy to work with and has great suggestions for developing innovative and interesting marketing materials. They just recently completed a membership brochure for our association that uses infographics in a very colorful and easy to read brochure. I would highly recommend Pedersen Design for any and all marketing needs. Pedersen Design is wonderful business partner. The Pedersen Team is creative, accommodating and a pleasure to work with. I believe that Pedersen’s designs and concepts have helped us generate more interest in our business thus helping us generate more revenue. Thank You Pedersen Design! The Metropolitan Fire Chiefs have been looking for an alternative to printing a Fire Chief Directory every two years that basically become outdated within a month of printing. Petersen Design came up with an online version that can be continuously updated and printed from the Metropolitan Fire Chiefs website. Since we haven’t printed a directory in several years, this new option was a huge hit with the members. Petersen Design also created a new website for the organization that is nicely designed and very easy to use. Finally Petersen Design gave use a time frame that I thought was unrealistic, but they completed it on time and continue to update both the website and the directory in a very timely basis. It is nice to work with such professionals that take pride in what they do. I recall the day I walked into your company’s office and said, “I need a good website”. Yours was the only company I considered to do the job. I mentioned there were varying types of quality in cars from Chevrolets to Bentleys which is my “dream car” and after some communication between us you said, “You’re getting a Bentley”. I’m pleased with the site and friendship that has come out of dealing with Pedersen Design. Although I’ll never own a Bentley I have the one in the quality of my website and our relationship. Dave Pedersen has been part of the Bicycle Commission for several years, and from day 1, has offered his professional services to our group. He is creative, easy going, easy to work with, and a marketing genius. He has developed many campaigns for us, from Bicycle Friendly Batavia Business, to redeveloping our bike maps, and planning/implementing a plan to use funding for Safe Routes to School by developing marketing concepts and all the physical materials we needed to use for promoting bike safety and bicycling in Batavia. In addition, I have worked with Karen and Pedersen Design on other campaigns, including the ones they do for the Batavia Fine Arts Centre. Again, they are incredibly creative and so easy to work with. 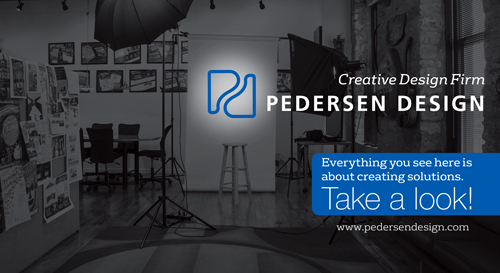 Pedersen Design will always be my go-to business anytime I need help with marketing or advertising. It is my pleasure to write a recommendation for Pedersen Design. Their marketing skills, enthusiasm and ideas have a been a great boost to the Batavia Bike Commission. Dave has come to the commission with a number of new ideas such as: the Great 8, Bike Friendly Businesses and town bike maps. His enthusiasm and marketing skills have made them become some of the stronger programs and marketing pieces that the commission does and the community sees. As a result of his design skills and experience it has raised the awareness of the community in the Bike Commission as well as really helped the commission become more visible. More importantly it has also helped us be more productive and have a higher bar of expectations. I would encourage your consideration in working with Pedersen Design: Dave is devoted to his work, a joy to work with and very enthusiastic about what he does. I met with and interviewed Pedersen Design as a possible marketing designer for our startup company, and I instantly saw Dave and his staff’s ability to present new and creative design ideas that I had never considered. Pedersen Design was able to complete our new company image on time and within our budget. I would highly recommend Dave and Pedersen Design to anyone looking for creative Digital Marketing. Pedersen Design is the best. Dave is great to work with, professional and has great ideas. The artwork they produce is top quality and installation is quick. We will continue to use Pedersen Design for all of our needs. Superb and very highly recommended! I was looking for a local person to handle the photography needs for all of our marketing communications. The nature of our business requires that we create several different designs (packages) to serve the various applications. So finding a local, responsive, knowledgeable, detail-oriented company that could handle our growing needs was important. We found that in Pedersen Design. The entire team at Pedersen Design continuously listen carefully to my vision and deliver a product that causes me to sit back in my leather chair and try to decide if I really live up to the image they put forward. They capture the essence of my organization in a way that motivates me to be a better company, and allows me to to absorb the depth of my accomplishments. I would recommend Pedersen Design to any company of any size – you will not be disappointed!